Disclosure: Diestel Family Turkey Ranch provided me with a turkey for the purpose of this post, as well as compensation for my time. As always, all opinions expressed in this post are mine. It’s Thanksgiving Week here at Perry’s Plate! 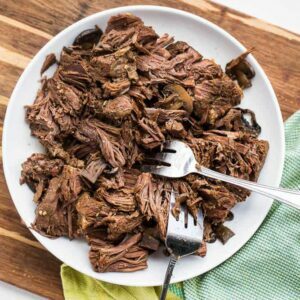 I’ve got a new recipe to share with you every day until Saturday — things that are paleo-friendly and so tasty that no one in your non-paleo extended family would know the difference. Honest. First, let’s talk about this dry brine turkey. And turkey in general. Have you ever heard of Diestel Family Turkey Ranch? 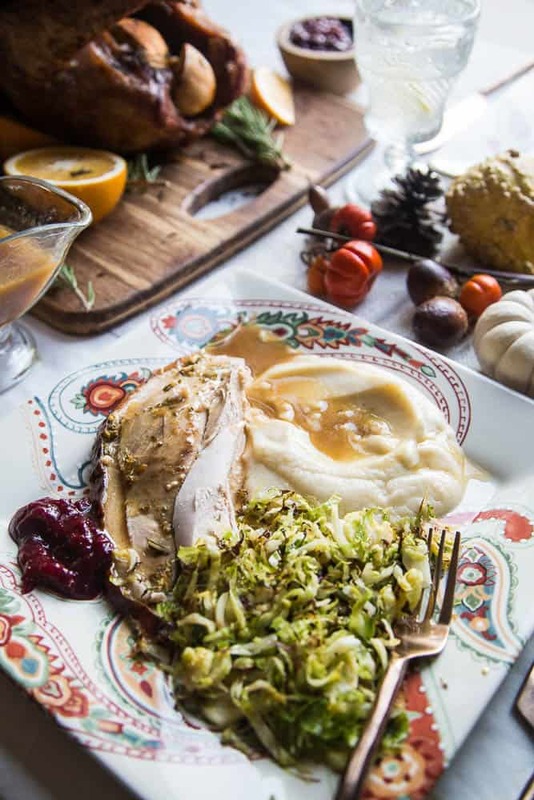 It’s a fourth-generation, family-owned turkey ranch in California that offers high quality, thoughtfully-raised turkeys. 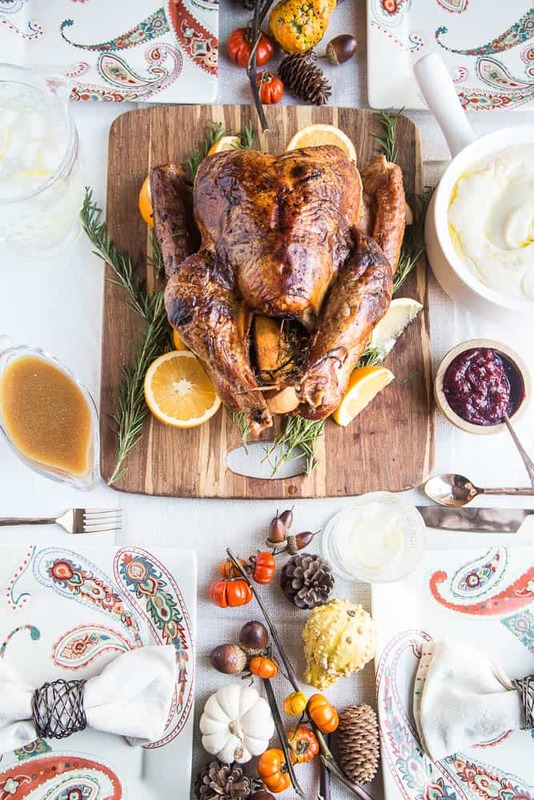 I’ve been buying Diestel turkeys from Whole Foods for Thanksgiving for the past few years, and I was thrilled at the opportunity to work with them and tell you more about them! Diestel mills and mixes their own grains on the ranch to feed their birds a 100% vegetarian diet enhanced with vitamins and minerals — which never contains antibiotics, growth enhancers or stimulants, hormones, gluten, animal by-products and DDG’s (dried distillers grains). 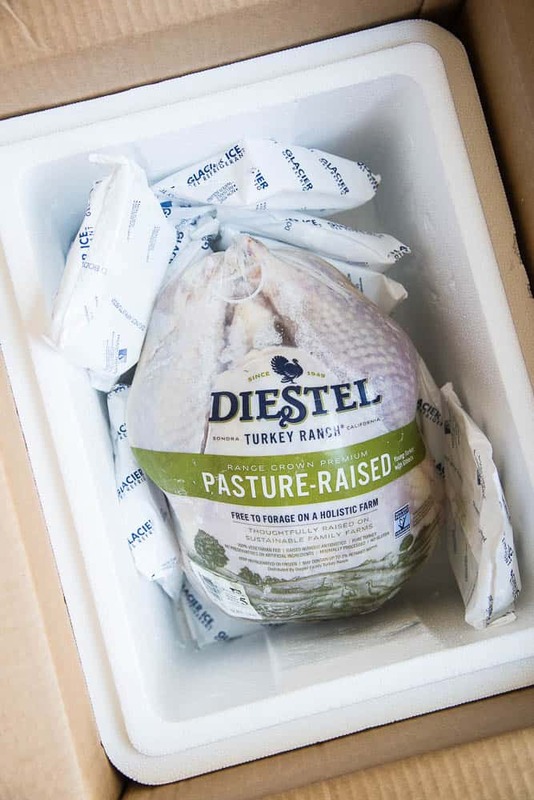 They also let the turkeys slow grow naturally to maturity, and Diestel was the first turkey producer in the USA to receive a GAP rating of 5 for their pasture-raised turkeys. GAP is Global Animal Partnership — a nonprofit with a mission to improve the lives of farm animals and help consumers make thoughtful purchases when choosing animal products. This particular turkey that I’m using is a 12 pound Diestel Pasture-Raised Turkey. These Non-GMO Project Verified birds are raised entirely on green, irrigated pastures (compliments of Diestel compost and reclaimed water) and are a part of the family’s holistic multi-species rotational grazing program. This bird came to my doorstep packed in an insulated box with dry ice, and it was still frozen when it got here! 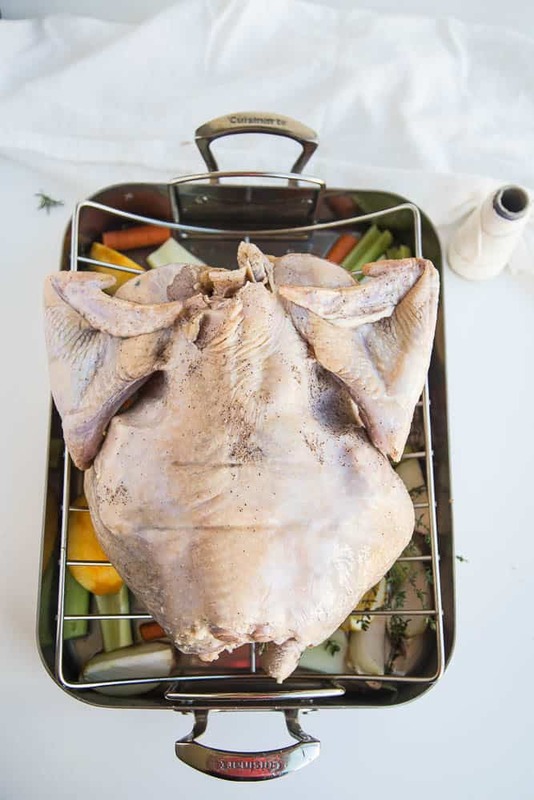 Let’s make a dry brine turkey, guys. Dry brining is like wet brining without the water. It’s more like a seasoning rub that you leave on the bird for a few days before cooking — at least 3 days and up to 4-5 days. I used Kosher salt, black pepper, and coconut sugar, keeping it simple since I was planning to use an herb butter under the skin later. Speaking of butter, I highly recommend using grass-fed butter for this. 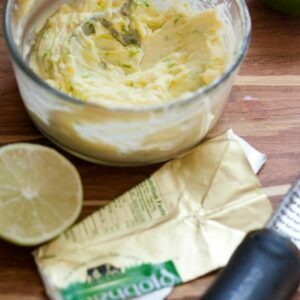 It has a richer flavor and is cleaner than traditional butter. You can also use ghee. Ghee is butter with the milk solids removed and it’s super easy (and cheaper) to make Homemade Ghee at home! Did you see that post I did a few years ago about making Herb Butter Coins for roast chickens? It’s such a brilliant hack, really. If you’ve ever tried to rub butter on meat, you know that most of it ends up on your hands. Making coins is so much better and it’s also really easy. I’ll show you in a sec. 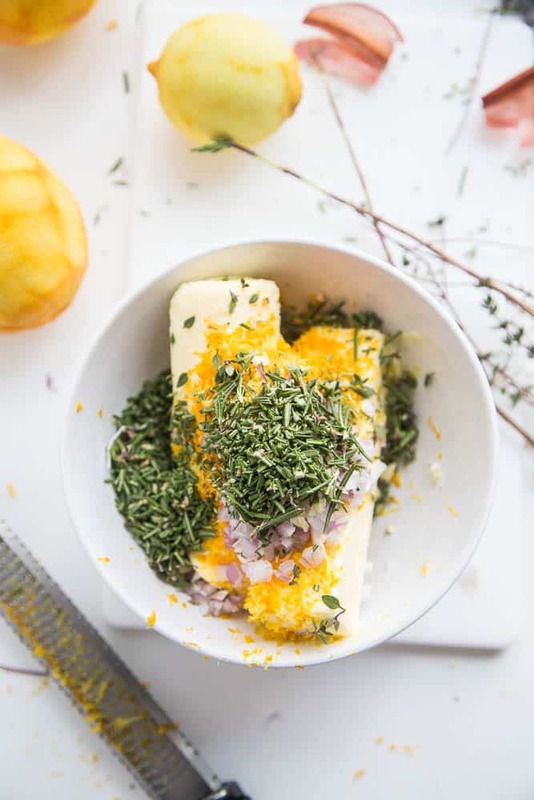 In this particular herb butter I used shallots, garlic, orange & lemon zest, sea salt, and lots of fresh rosemary and thyme. Side note: Using herb butter makes THE BEST GRAVY EVER. Once you get it all mixed together, dump it out onto a piece of parchment paper. Then roll it up like a giant piece of candy. (That’s what my 5-year-old called it.) Put it in the fridge until it hardens. You can do this several days ahead of time if you need to. 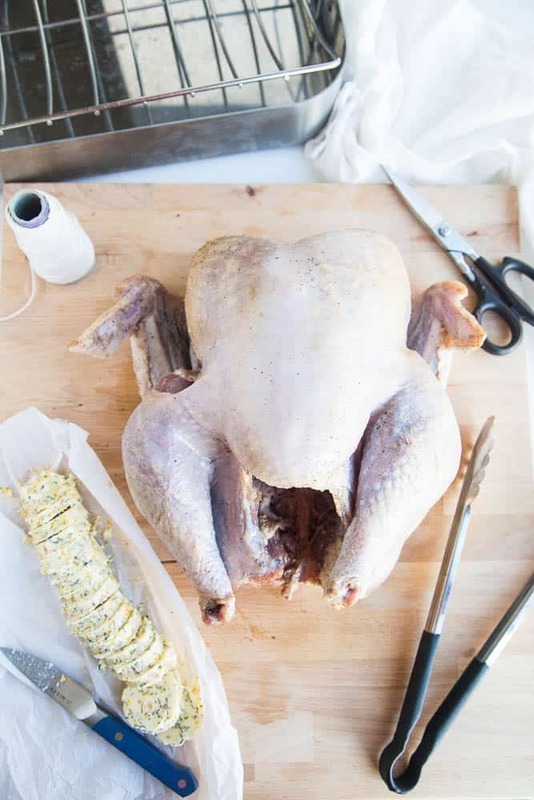 When the turkey is brined and you’re ready to prep it from the oven, you’ll need to gather a few things — a sharp knife, kitchen twine, scissors, your roasting pan, and a heavy pair of tongs to help move the turkey around. Also, the stuff you plan on putting inside the turkey. Prepping a turkey is like prepping a really big chicken. There’s not that much difference, really. I wiped off the extra brine because I didn’t want the skin too peppery. Don’t wash it off though, because you’ll need that extra flavor. I also loosened the skin from the flesh using my fingers and the end of a plastic mixing spoon to get into hard-to-reach areas. After I cut the herb butter into coins, I inserted them under the skin. (See how much easier this is!?) I also made small incisions in the skin between the leg and thigh so I could get butter coins in those places, too. Don’t worry if the skin rips a little. Try to be careful, but sometime it happens. Like that leg on the left up there. Oops. Stuff some citrus and herbs into the body cavity, tuck the wings behind the body and tie the legs together. And drizzle the whole thing with avocado oil. I put some celery, carrots, onion, fresh herbs, and orange halves in the bottom of the roasting pan with about 2 cups of water, too. Now…. flip the whole thing over. Yep. Do it. Starting off the cooking process upside down lets the juices flow to the breast meat, which is where it needs to be. It’s the area of the bird that usually dries out the most. After an hour or so, flip it back over to finish cooking and make sure to baste it occasionally. Ta-da! Check out that beautiful bird! Making a dry brine turkey is so much easier than an immersion brine. 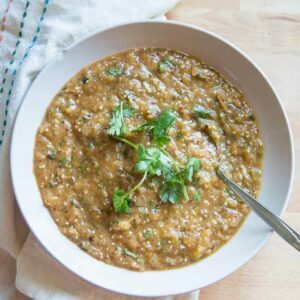 The recipe may look long and daunting, but it’s really not hard! There’s just a lot of explaining. The gravy turned out FANTASTIC. Herb butters make the best gravy, I swear. We ate our turkey with some Garlic-Rosemary Cauliflower Mash (Fast and easy — in my Instant Pot! Recipe for that coming this week, too! ), Roasted Shredded Brussels Sprouts, and Wassailed Cranberry Sauce. Also, SAVE YOUR BONES!! I got 2 gallons of turkey stock out of this lovely lady. You can use the Homemade Chicken Stock recipe and use the biggest stock pot you have. I was so happy with this turkey, and I’m such a fan of Diestel’s products and mission. They also make year-round turkey products including Non-GMO Project Verified and organic deli slices, chorizo, and turkey sausage. I’ve tried all of these over the past few years, and they’re super tasty. (PSST — Their chorizo is Whole30 compliant! I nearly had tears of joy when I found it. I love chorizo a lot.) 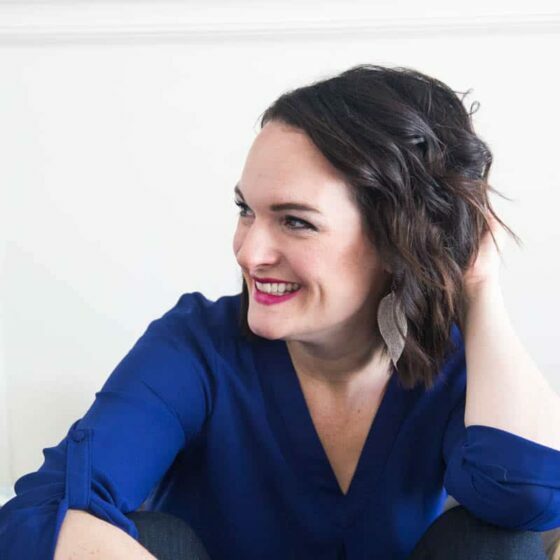 If you’d like to connect with Diestel you can find @Diestel on Facebook and Twitter. AND, the lovely folks at Diestel are giving Perry’s Plate readers $20 off any whole turkey and cook-in-bag breast roast, no limit per customer, maximum discount $40 per order, valid through Nov. 17th 11:59PM PST, online at Diestel Store only. Just use the code PERRY20 when you check out! Did you catch the other recipes posted during Thanksgiving Week? 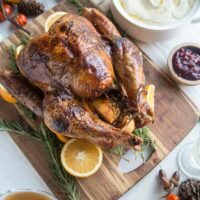 Here's how to make a dry brine turkey along with a flavorful orange-rosemary herb butter for good measure! It's so much easier than using an immersion brine -- no need to fill your stock pot and then hunt for a place to put it in your fridge. Additional sprigs of fresh rosemary and thyme, plus more for garnish, if desired. Remove the neck and giblets from the turkey. Wipe any moisture from the turkey with a paper towel. 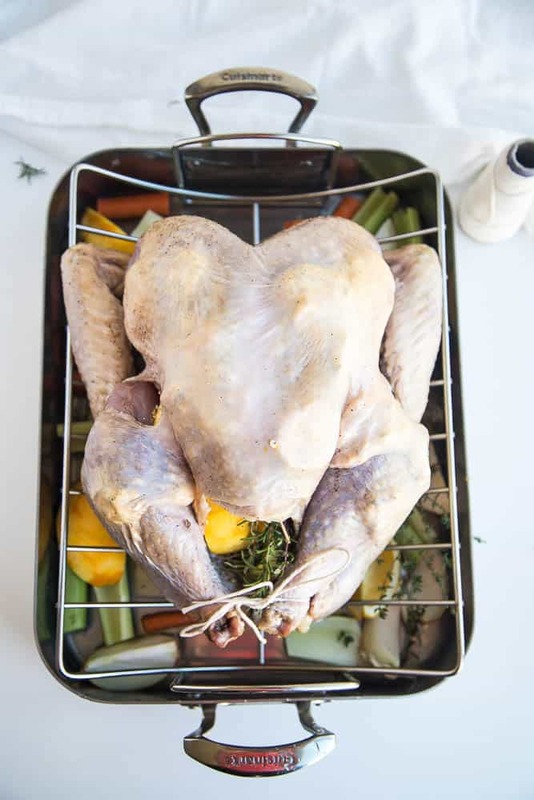 Place the turkey on a rimmed baking sheet or something for it to sit on while brining in the fridge. In a small bowl, combine the Kosher salt, coconut sugar, and black pepper. Rub the mixture all over the skin of the bird. Wrap the bird in plastic wrap and chill for at least 3 days. 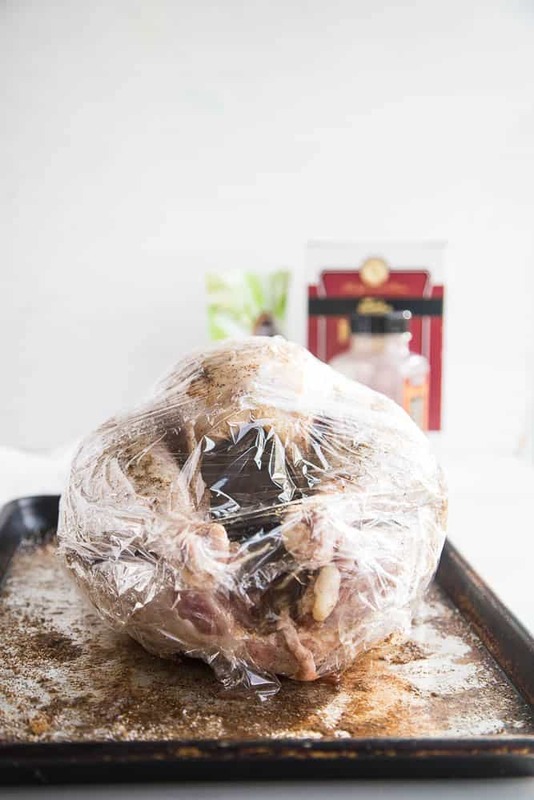 At the beginning of the 3rd day, remove the plastic wrap and let the bird dry, uncovered, in the fridge for the last day of brining. This will make the skin crisp up nicely. 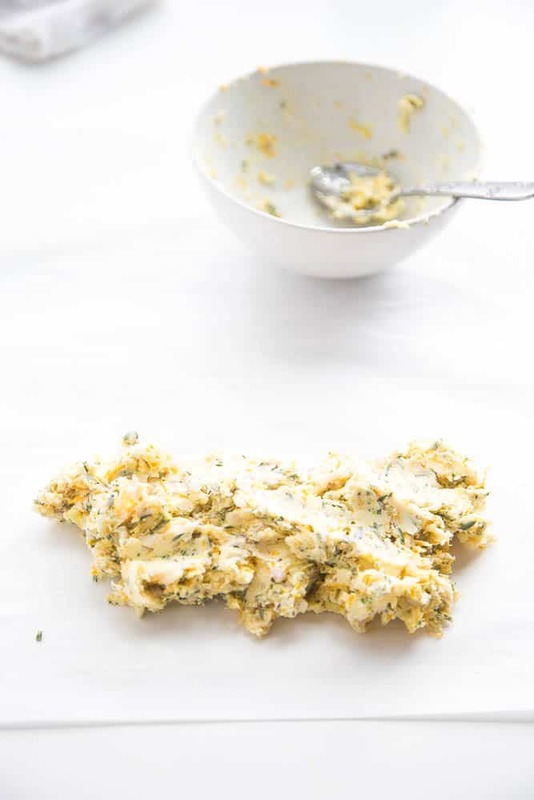 Mix the herb butter well, then transfer it to one side of a large piece of parchment paper. 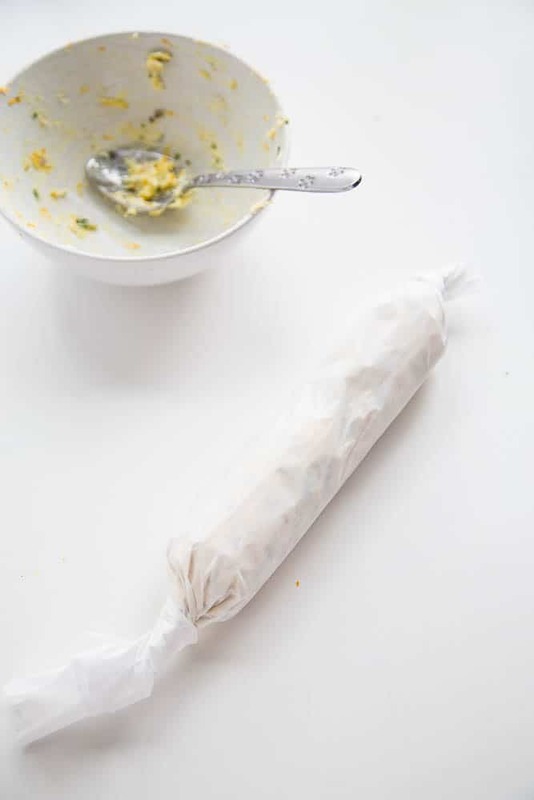 Fold the edge of the paper over the butter, an using your hands, form it into a log shape, rolling it up in the parchment and twisting the ends to seal. Chill until ready to use. About an hour before you plan on roasting the turkey, remove it from the fridge. Wipe some of the excess brine from the skin with a paper towel. Do not rinse. Use your fingers to loosen the skin from the meat around the breast area. You may need to use the end of a mixing spoon to detach the skin around the top of the breast if it's hard to reach with your fingers. Be careful not to pull too hard and tear the skin too badly. Do the same with the leg and thigh areas, making a small incision between the leg and the thigh to access both areas. Pull out the reserved oranges and lemon. Slice them in half and put two halves along with two lemon halves and a couple of herb sprigs in the cavity of the chicken. Put one orange half (reserve the last orange half for the gravy) in the bottom of the roasting pan. Add the onion, celery, carrots, herbs, and 2 cups of water. Place the roasting rack on top. Tuck the wings behind the body and tie the legs together. Place the turkey, BREAST-SIDE DOWN (yes, upside down) on the roasting rack. Preheat the oven to 425 degrees F and let the turkey sit at room temperature until the oven heats up. Roast on the bottom rack for 1 hour. Reduce the oven temperature to 325 degrees. Flip the turkey over using heavy tongs and an oven mitt, so it is breast-side up. 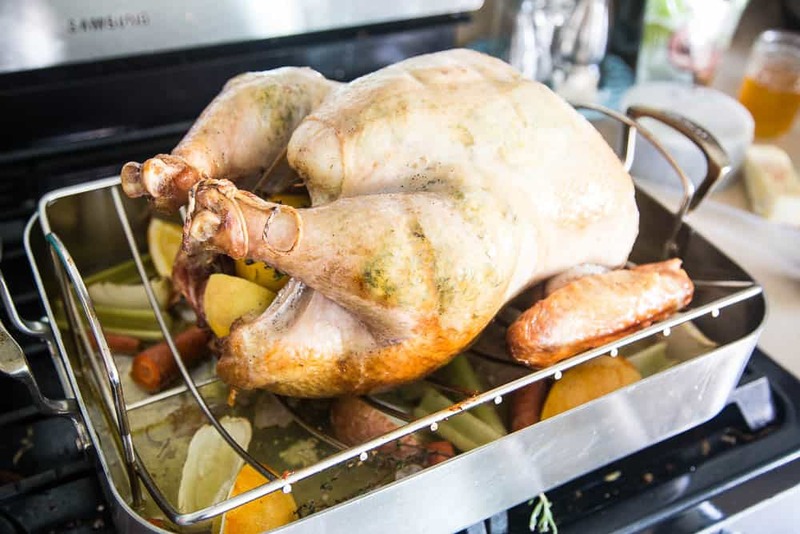 Baste, and continue to roast, basting every 20-30 minutes, until the internal temperature of the thickest part of the breast is 155-160 degrees. My 12.5 pound turkey was finished in about 2 hours and 15 minutes. Remove the turkey from the oven and let it sit for at least 30 minutes before slicing so the juices don't run out all over. To make the gravy, use a slotted spoon to fish out the vegetables and the orange half. Place the roasting pan (if it is stove-top safe) over medium heat. Whisk 2 cups of the broth with the tapioca starch and pour it into the gravy, whisking constantly. Cook until the gravy is bubbly and thickened slightly. Add the butter or ghee and stir until smooth. Taste, and add salt, if needed. Strain and keep warm until ready to serve. I’m making this, this year! 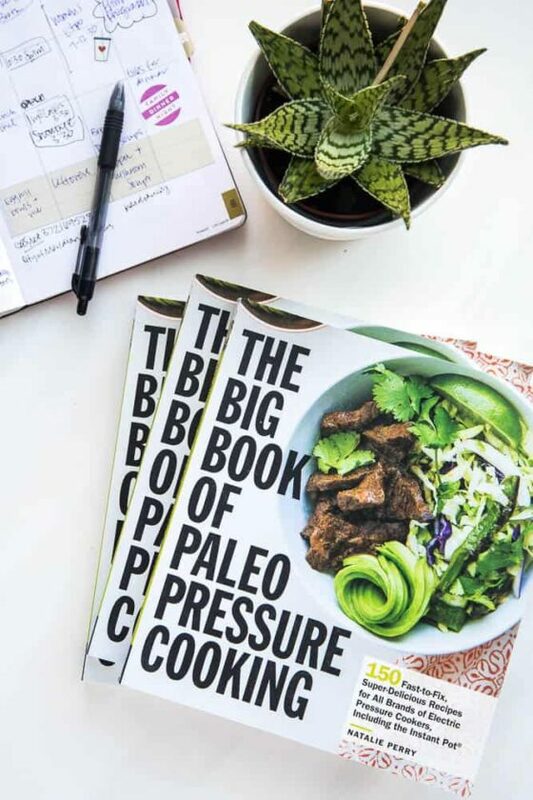 I’ve been looking into other paleo recipes, and I’m wondering what’s better or if it matters.. tapioca starch or arrowroot? Which one would be most versatile so I wouldn’t necessarily need to have both… or should I? 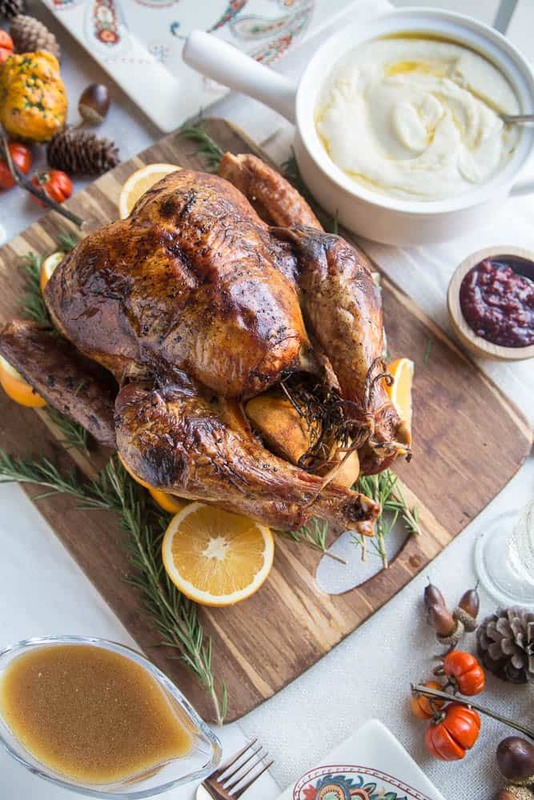 I ALWAYS wet brine my turkey…so now I need to try dry! And that butter? YES PLEASE. That is one beautiful turkey!! I love the dry brine-I bet it keeps it so moist. Thank you Julia! I loved how it turned out, too! I’m hosting this year so your post is perfectly timed!! How fun!! And stressful! But mostly fun :) Good luck! Hi there. I can’t wait to try this recipe for Thanksgiving this year! My question is, you said it took you 2 hours and 15 minutes to cook the bird. Does that include the one hour at 425 or was the 2-hour 15-minute additional to that?